We've been following turtle #067—a rescued Kemp's ridley sea turtle—during rehabilitation after it washed up on a beach with hypothermia last fall. First it took a field trip for specialized diagnostics. 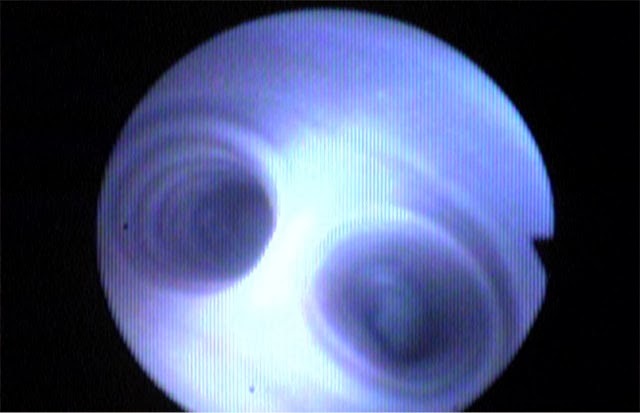 Today's post is about a bronchoscopy. Our last post about #67—or Kaboom—was about her CT scan procedure performed at Massachusetts Veterinary Referral Hospital. The CT scan confirmed pneumonia and revealed an area in the right lung with diseased tissue. Our veterinary staff determined it was necessary to perform further diagnostic procedures in order to understand how bad the lungs really were and determine the best course of action. #067 had to be intubated and put under anesthesia for the procedures. Here, Aquarium staff intubates the turtle. 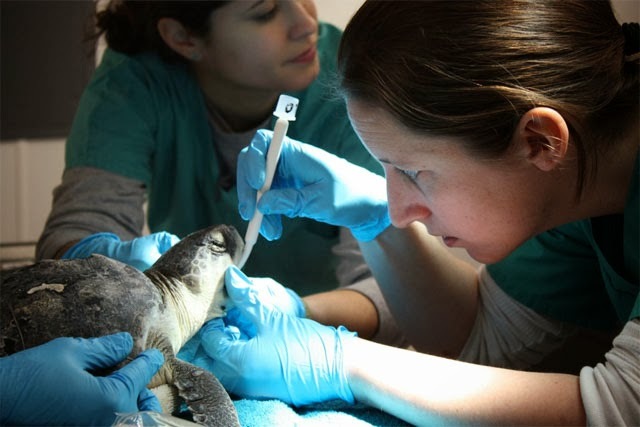 Last week #067 was transported from the Animal Care Center in Quincy to the main building of the Aquarium in Boston, where she underwent two procedures: a bronchoscopy and a laparoscopy. In this post, we'll talk about the bronchoscopy. Both procedures are pretty similar in the sense that they use a scope with a light and a camera in order to visually examine internal organs; in this case our main focus was lungs. The bronchoscopy required our veterinarians to insert a little scope through the trachea ultimately reaching the bronchi of the lung. This allows the veterinarians to visualize the lung tissue and determine if it looks normal or diseased. Dr. Charlie Innis maneuvering the scope down the trachea towards the bronchi. and right leading to the right lung. 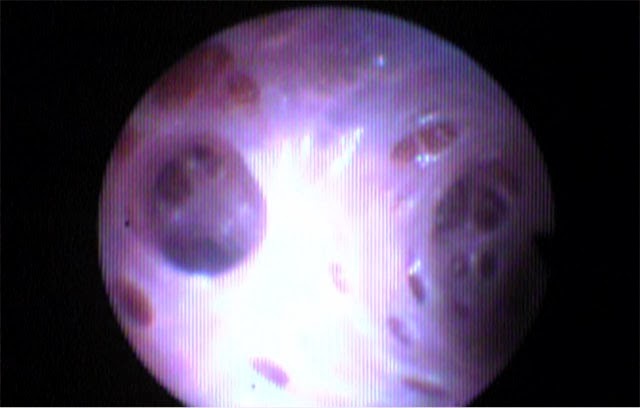 Upon initial visual examination we did not see anything that looked bad, the lung tissue appeared normal and there was no mucous or discharge. 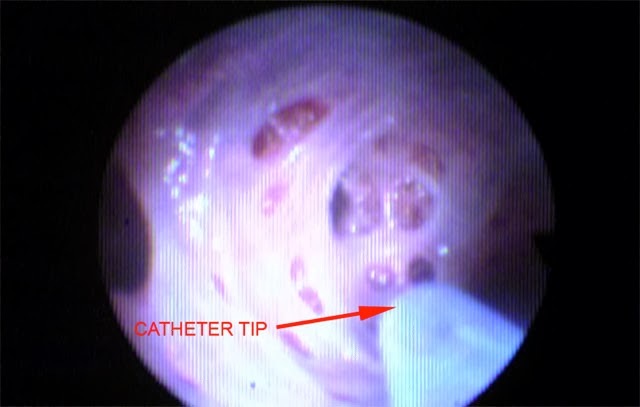 While we were inspecting the lungs with the bronchoscope, we also performed what we call a “tracheal wash”. This was done by inserting a small sterile catheter (tube) through the trachea into the bronchi and injecting a small amount of sterile saline solution into the bronchi/lungs, which was then pulled back into the syringe and sampled. The idea behind the tracheal wash is to get the bacteria or fungus that is causing the pneumonia to “mix” with the saline solution so that we can get a good sample of it. When we do, we can hopefully find out what microorganism it is and what antibiotic or antifungal will be most effective in fighting it. 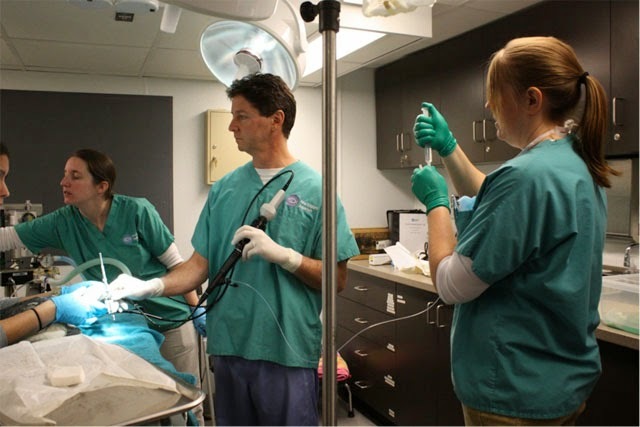 On the outside: Dr. Charles Innis holds the scope in place while Dr. Julie Cavin injects sterile saline solution through the clear catheter leading into the lungs through the scope. On the inside: The lung tissues with the tip of the catheter before we injected the saline solution. 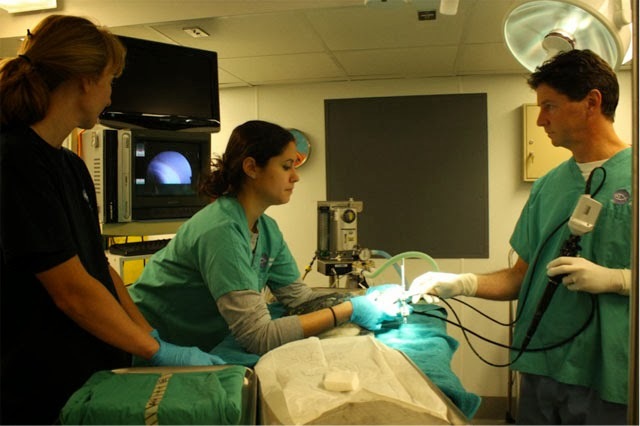 Since the bronchoscopy did not reveal any bad lung tissue that we could sample for further tests, our veterinarians decided to proceed to the laparoscopy. We'll be posting about this during a later post. Stay tuned!